The latest DOOM brings you a new creating tool SnapMap with which you can you create your own map, including placement of demons, weapons, selected sounds, special effects and much more. The idea is simple and it could revolutionize gaming world. In order to create your own map with the editor, you don’t need to go through any introduction or long tutorials. 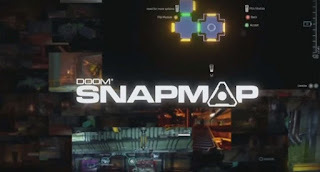 The developer ID Software claims that everyone can really create their own map with the SnapMap without having any prior experience. Especially a lot of time has gone into the control of SnapMap that runs smoothly on the gamepad and mouse and keyboard. When creating a map it navigates through the first-person perspective. But, you can also view select "blueprint", especially when it comes to larger maps, thus you keep a good overview of your creation. But you can just as quickly "fly" through the rooms or you look at the map in an external view, like a spaceship look at your map. So it is possible for you, among other things, simply to highlight a whole room with the mouse and take this to turn or move to another location. In addition, you can also map from the perspective of a player to explore and test them before you presented your friends. The user interface is simple and SnapMap tool menu hardly ignorable. You can map all possible modes created: Single player, multiplayer or co-op. In addition, you are allowed to the final result also other gamers thus provide free and publicly. This in turn allows a repertoire of almost unlimited maps for Doom. If the map is ready then you can connect to the server and start to play immediately. Apart from the actual design of the map, the SnapMap provides numerous components infinite possibilities in the general level architecture, this includes: All opponents, objects and Textures. The SnapMap is very profound. Many objects can be individually adjusted and determined in its functioning. - Development of numerous space elements in different shapes and sizes. - Control the speed of characters. - Control the damaging effect of weapons. - Integration of all demons and monsters, while setting, when they appear, and what happens after death. Also renaming the monster is possible. Monster can be adjusted individually. Here you can determine their health or life points, the spawn behavior or whether a glory kill is necessary. - Placement of objects on the huge database, which can be edited even retrospectively as lighted tones or other explosive objects that the player must be careful, as it passes; however this can be useful if it is taken by an opponent. - Connecting the objects of logic chains, so the game knows when a Level is considered complete. - Integration of control elements such as Counter with buttons that set something in motion, for example, opening a door or summoning a demon horde. - Control the gameplay by example Timer, teleporters platforms with choice of teleportation target, pressure shield that trigger something, use of energy stations, placement of ammunition boxes and panels etc. - Placement of light and sound effects, which may vary from room to room as the light goes out in a certain section, when you enter the room. Also fog, smoke or fire may be placed. - Integration of playful elements, such as a keyboard on the ground, a drum sequencer, a tower defense game or Parkour level that is strongly reminiscent of Mirror's Edge, and more. Fact is, this could be revolutionized the game world: Players build their own map, their own game along with all new modes. The options in the SnapMap are limitless and numerous. So come at the end materialize gameplay results that are entirely new and can create a unique gaming experience.